Healthy, homemade, easy, garlic spaghetti sauce loaded with veggies and flavor is the perfect sauce to top your favorite pasta dish. It makes enough to put up for later, making meal time quick and easy! I’m sure that by now you’ve heard the new Dietary Guidelines for 2015-2020 are out for the American public. Among other recommendations for a healthier America, the guidelines call for limited sodium and added sugars. Did you know that added sugar and an ungodly amount of sodium is usually hiding in commercially made sauces? Spaghetti Sauce is often one of the biggest culprits, although we typically think of it as healthy. Tomatoes and spices should be healthy, right? Unfortunately, many Americans’ diets are so packed with added sugars and salt that our palates have become desensitized to it. Manufacturers add sugar and sodium to almost everything in order to keep up and make their product sell. Sadly, our health is not the priority. One way to make sure you don’t fall victim is to make your own pasta sauce at home. That way you control what goes in it and what your family eats. I know, homemade spaghetti sauce is a pain and you don’t want to make a pot of it every time you want some Italian food. Pasta is supposed to be one of those quick go-to, no-mess meals, right? It still can be! 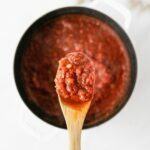 My solution is to make a giant batch of spaghetti sauce and can it in the pressure cooker so that I have about 8-10 jars ready to go when my husband and I have a busy day and need a quick meal. Then we just heat the sauce up, pour it over zucchini noodles or pasta, and we’re ready to eat! You don’t have to can this easy spaghetti sauce. It can be a little intimidating if you haven’t practiced, but at this point it is easy for me to do on a weekend day (I’m a bit of a grandma and have been canning since college). You could just as easily freeze it in batches so all you have to do is pull it out of the freezer. This way you have a quick and easy dinner that you can put together in a pinch, and one that you can feel good about feeding to your family. Enjoy! Healthy, homemade, easy, garlic herb spaghetti sauce loaded with veggies and flavor is the perfect sauce to top your favorite pasta dish. It makes enough to put up for later, making meal time quick and easy! In large stock pot, heat olive oil on medium heat. Add chopped onion, pepper, and garlic and cook until translucent. At this point, transfer veggies to a blender or food processor and carefully blend until they are finely chopped. Pour back into pot and continue. If you prefer a chunkier sauce, you can skip this step. Add the tomatoes (including the juice), sauce, and paste. Stir in remaining ingredients. Let sauce come to a boil, then reduce heat and let simmer for about an hour. Enjoy over your favorite pasta or on top of pizza, etc. Pour hot sauce into washed, prepared jars that are still hot, leaving about a half inch head space. Wipe the rims with vinegar and place prepared lids on top. Screw on rings to seal lids. Place jars in hot water bath or pressure cooker to process. A water bath will take longer, about 30-45 minutes. If you are using a pressure cooker, they need to process only about 10 minutes. Remove jars from water and place on a towel to cool. Listen for the ‘pop’ to know they are sealed properly. If one does not seal, store it in the fridge and use within a few days. Sealed jars may be stored in the pantry or cabinet for up to 6 months. For your safety, always make sure sauce comes to a boil when re-heating it. This makes a really big batch! You can absolutely scale it down (half or quarter) to fit your needs.